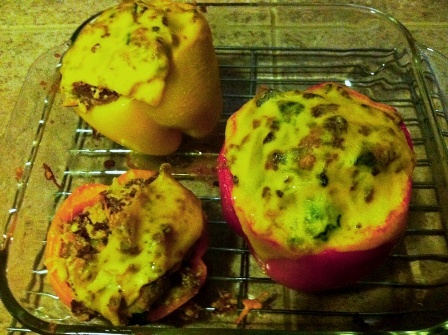 For these stuffed peppers I was going for a kind of “Impossible Cheeseburger Pie” (if you ever had that, it was a staple of ours when I was growing up) taste and texture – in a pepper. These would be good with some homemade ketchup, but I forgot about making that ahead of time! These were amazing! Thank you so much! My whole family loved them. The recipe was perfect. No changes needed. Hi! When do the salt pepper and turmeric go in? Thanks!